LYNN, Mass. -- The North Shore Navigators drew a little bit closer to the eighth summer of Futures Collegiate Baseball League (FCBL) competition at Historic Fraser Field with Monday’s unveiling of a 2019 schedule. General Manager Bill Terlecky, who is in his eighth season leading the Navs under Owner Pat Salvi, made the announcement. The 2019 campaign is scheduled to open on Thursday, May 30 with a trip to Brockton’s Campanelli Stadium for the first of 10 meetings between the Navs and Rox. North Shore will follow up the trip to the South Shore with a Friday game in Worcester before opening its home schedule on Saturday, June 1 at 6 p.m. against the Nashua Silver Knights at Fraser Field. 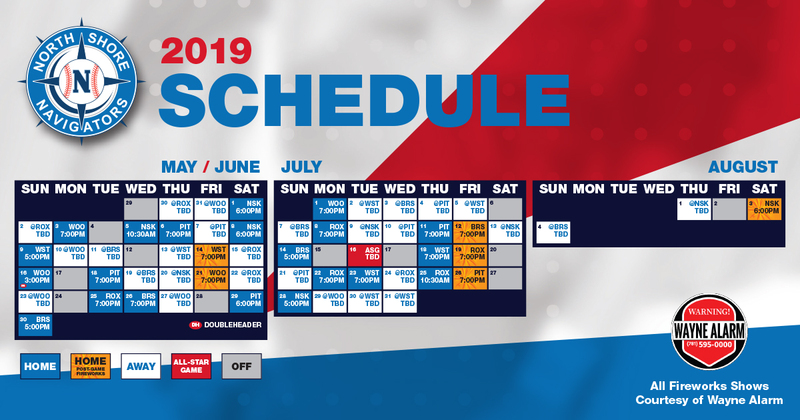 The 56-game schedule features 28 home games, including five popular “Fireworks Friday” nights, four Saturday games, and five Sunday dates. An additional fireworks show will follow the team’s final home game of the regular season on Saturday, August 3. All six fireworks shows are sponsored by Wayne Alarm. Seven teams will make up the FCBL once again this summer, with the top six qualifying for the postseason in early-to-mid August. An expansion franchise in Westfield, Mass., joins the fold and replaces the Martha’s Vineyard Sharks who joined the New England Collegiate Baseball League earlier this month. The Navs will make their first visit to Westfield on Thursday, June 13 before the teams complete a home-and-home series at Fraser the following night. The Navs will play Westfield, Nashua, the Pittsfield Suns, and Bristol Blues nine times apiece throughout the summer, while the Rox and Worcester Bravehearts both will be North Shore’s opponents in 10 games. Times for 2019 home games remain unchanged. With a few exceptions, Monday through Friday night starts are set for 7 p.m., Saturdays begin at 6 p.m., and Sundays at 5 p.m. The Wednesday, June 5 and Thursday, July 25 games against Nashua and Brockton, respectively, will both begin at 10:30 a.m. The Bravehearts come to Fraser for a 3 p.m. doubleheader on Sunday, June 16. Family season passes, which admit four to all home games, are on sale for $100. Registration is also open to rent one of the Navigators’ party decks or schedule a birthday party at Fraser Field. Email Bill Terlecky at navigatorsgm@gmail.com or visit nsnavs.com for more information.